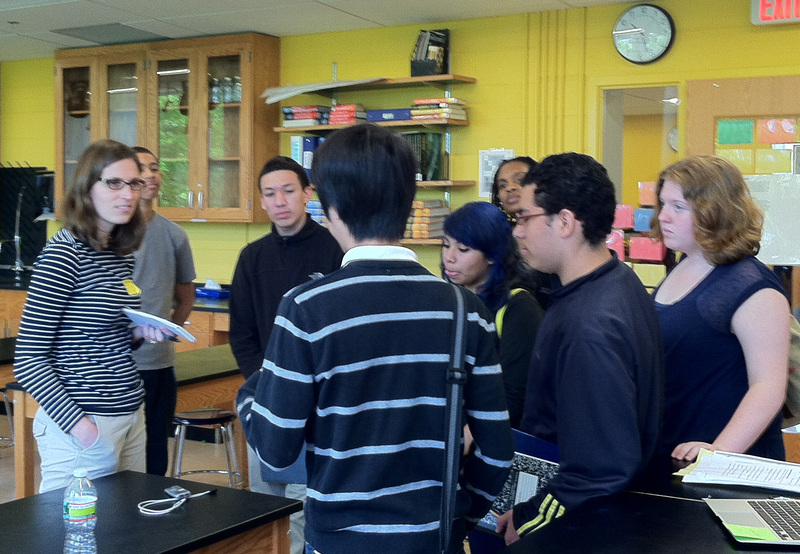 Ting spent a most enjoyable May 2nd at Capital City Public Charter School (Washington, D.C.) with three of Ms. Schroeter’s Biology classes, Ms. Nordeen’s Biology class, and Mr. Hipkins’ History class. The conversations were great, covering topics ranging from preimplantation genetic diagnosis (PGD) to eugenics. Two classes also considered the implications of genetic information for organizations, such as NASA, which are aiming to put people on Mars! We were joined earlier in the day by Ms. Gambino, an Online Reporter for the Smithsonian Institution. Ms. Gambino sat in on two of Ms. Schroeter’s classes and then interviewed several students to learn their viewpoints regarding what they had learned about personal genetics (photo: Ms. Schroeter is third from the right, and Ms. Gambino is wearing a yellow name tag). We hope that the students (and friends, family, other teachers and staff at CCPCS will take a few minutes to play our genetics education game – Map-Ed! Pin yourself on our global map! Personal Genetics Education Project - pgEd.org shared a Becoming a Scientist with National Institutes of Health (NIH) Director Dr. Francis Collins. An event that our teacher friends may find useful: NIH Director Dr. Francis Collins will be hosting a Facebook Live event on Monday, Dec 10th from 3:15-45 pm ET, where he will take questions from middle school students from across the US. You are invited to livestream this event to your classroom and submit your students' questions in the event feed's comments section!